Ballot Initiative: Raise Alaska's Minimum Wage! We're on the ballot - in November! We have survived the legislative session, but have been bumped from the August primary election to the November general election ballot. This happened when the legislature went past the April 20 adjournment deadline, which put the August election less than the required 120 days after adjournment. As expected, there was an attempt by the House Majority leadership to knock us off the ballot by passing a bill "substantially similar" to the Initiative. This would have set the stage for a repeat of the legislative chicanery of 2002-2003, when the legislature preempted a minimum wage initiative with a bill which they gutted the following year. This time, Alaskans knew what was really behind the House's sudden interest in passing a minimum wage bill, and they made their opposition known to the legislature with public testimony, phone calls, letters and emails. Even with the House Speaker as prime sponsor of the the phony bill, it barely passed the House by one vote on April 13. The Senate, to its credit, never took up the House bill, despite continuing pressure from Speaker Chenault, even into the final "extra" days of the session. So - onward to the November ballot! Our initiative has been certified by the lieutenant governor for placement on the August 19 state primary election ballot. A recent poll conducted for the Republican Legislative Majorities by Dittman Research showed 69% support for the minimum wage Initative among Alaskan voters, with majority support among all parties and voter groups. - On March 29, the Joint Judiciary Committees of the Alaska Legislature held an informational public hearing on the initiative. Invited testimony was provided by the Alaska Department of Labor, initiative sponsor Ed Flanagan, Reverend Michael Burke of St. Mary's Episcopal Church in Anchorage, Alaska AFL-CIO president Vince Beltrami, and Michael Saltsman of the Employment Policy Institute -a faux "think tank" funded by the restaurant industry and other corporate sponsors to oppose efforts to raise the minimum wage. If you have one hour and forty seven minutes to spare, you can listen to hearing here . After having the highest minimum wage in the nation for the four decades following statehood, Alaska has fallen in recent years to 17th place among the states, behind even Florida and Arizona! A single parent working full time, 2080 hours at the current minimum wage of $7.75, earns only $16,120 annually, less than two-thirds of the poverty rate for a family of three in Alaska. Had the Alaska Legislature not repealed in 2003 the modest cost of living adjustment mechanism they had approved less than a year earlier in the bill raising the Alaska minimum wage to $7.15, that wage would be $9.53 today. It is time for Alaskans to correct this inequitable situation, and the only way to get it done properly is by citizen initiative (which the legislature could not circumvent for at least two years after its effective date). Alaskans for a Fair Minimum Wage was established by three former state labor commissioners - Ed Flanagan, Tom Cashen, and Jim Sampson - to get the minimum wage on the August 19, 2014 state primary election ballot. The initiative would require an increase in the minimum wage from the current $7.75 to $8.75 on January 1, 2015, to $9.75 on January 1, 2016, and then adjust it by the change in the Anchorage Consumer Price Index (CPI), or one dollar over the federal minimum wage, whichever is greater, annually. Please click here to see how you can help create a fair minimum wage in Alaska. Together, we can have a fair minimum wage in Alaska. 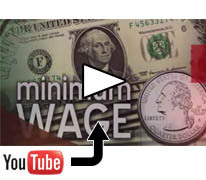 Check out this YouTube video by UAA student and minimum wage volunteer Samantha Boland.